Anika may be the third most popular girl in school but she still has to obey Becky’s rules. So when Logan McDonough returns in September looking better than ever, Anika has to quiet her feelings for the long time dork. To make matters worse, the town heartthrob, Jared, has the hots for Anika but Becky is secretly in love with him. Anika doesn’t know where she belongs and any choice could ruin friendships. 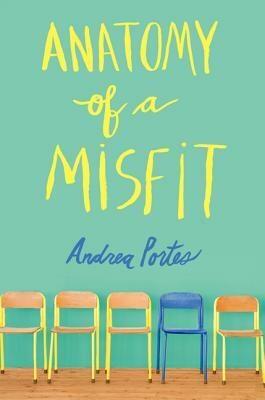 Andrea Portes’ Anatomy of a Misfit dissects an age old love triangle with a new twist. In this Mean Girls meets The Perks of Being a Wallflower tale, narrator Anika Dragomir is the third-most-popular girl at Pound High School. But inside, she knows she’s a freak; she can’t stop thinking about former loner Logan McDonough, who showed up on the first day of tenth grade hotter, bolder, and more mysterious than ever. Logan is fascinating, troubled, and off limits. The Pound High queen bee will make Anika’s life hell if she’s seen with him. So Anika must choose—ignore her feelings and keep her social status? Or follow her heart and risk becoming a pariah. Which will she pick? And what will she think of her choice when an unimaginable tragedy strikes, changing her forever? An absolutely original new voice in YA in a story that will start important conversations—and tear at your heart.